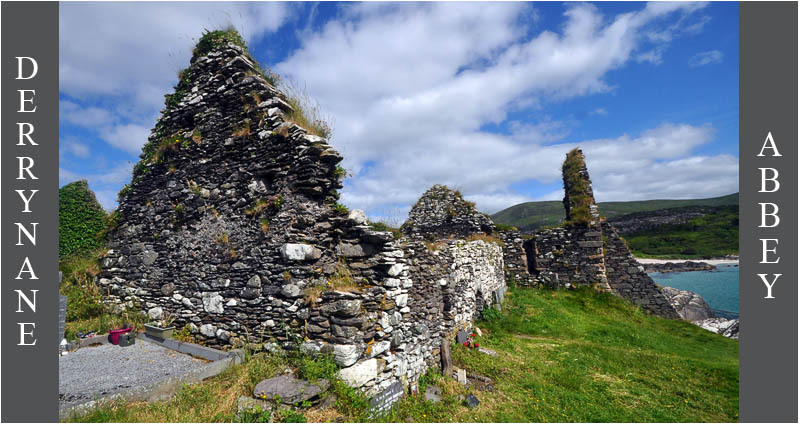 This is certainly one of the most beautifully located monastic sites in Ireland. On the day we arrived at Derrynane to see the Abbey the funeral service and burial of a young teacher had just concluded. The small parking area was crowded and we waited to obtain a spot to park while talking to a gentleman who told us about the tradition (and necessity) of carrying the coffin across the beach and up a small hillock to get to the graveyard on Abbey Island, and that access was limited to low tide periods. This set the stage for viewing these ruins in a new light. Built on the monastic site founded by St Finan Cam (aka St Finian) in the 6th C, all that remains of the abbey are a Romanesque church and two other connected structures believed to be built in the 10th Century. 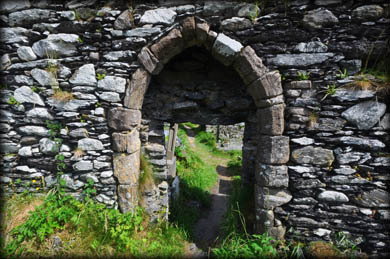 The ruins are now spectacularly perched on the edge of the hillside, with three well preserved lancet church windows facing the sea. This wall has since been buttressed to preserve the church and windows. 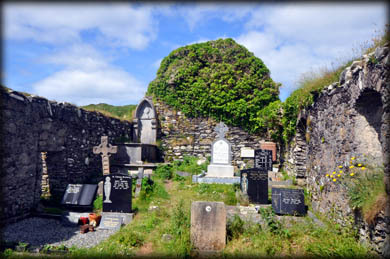 The graves in the cemetery and inside the church span centuries. One grave is that of Mary O'Connell, the wife of Daniel O'Connell, who campaigned for Catholic Emancipation in the early 19th Century and for whom O'Connell street in Dublin is named. 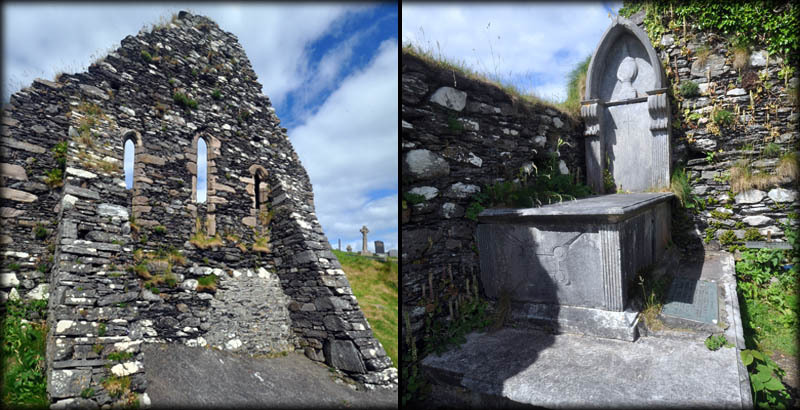 The three lancet windows in the east gable, pictured left, and the grave of Mary O'Connell, wife of Daniel O'Connell. 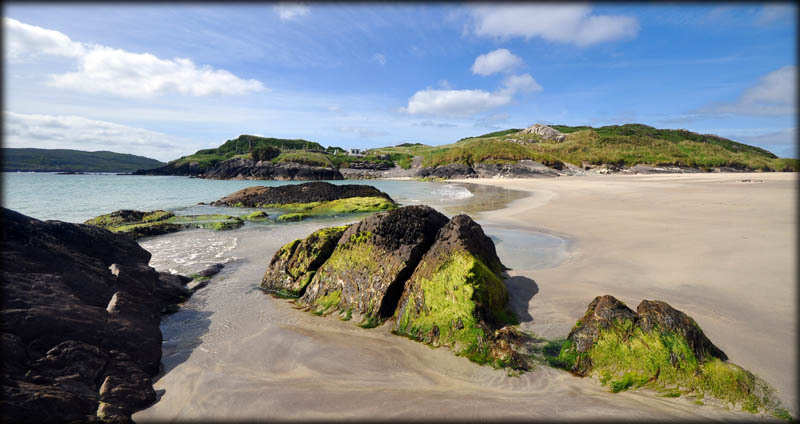 Situated: Travelling around the Ring of Kerry from Kenmare to Killorglin, after Caherdaniel take a left turn and follow the road to the beach at the very end. 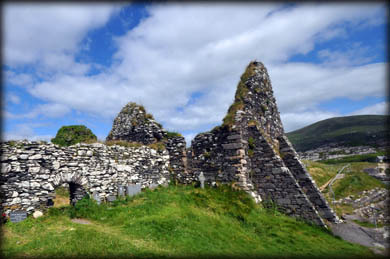 The abbey is on a small spit of land jutting out from the beach. Discovery Map 83: V 5208 5829. Last visit June 2018.